Let our experienced team of food truck experts make confirming the food & beverage for your event a simple (and even fun!) experience. The NYFTA provides food truck catering & consulting services for large events, conventions & festivals in New York City & the tri-state area. Work with the NYFTA to create delicious memories for your attendees. With over 10+ years of food truck experience & a national vendor network, we know which food trucks and carts offer professional, reliable service and the highest quality cuisine. Several NYFTA members are award-winning or nationally recognized for their gourmet food truck offerings. Contact us today to discuss all the delicious options & find the perfect food truck vendors to cater your large event; whether it's a conference, convention, festival, sporting event, concert. NYFTA manages mobile vendors at NYC's biggest events, including New York Comic Con & Belmont Stakes, serving over 100k+ guests annually. We know the ins-and-outs of big events to keep guest satisfaction rates high & make your event a success. From partnering with food-truck friendly venues & resident caterers, to securing permits & insurance paperwork, and managing the staffing & point of sale system, we save time & make working with multiple mobile food vendors easy as pie. From beginning to end, we make sure everything goes off without a hitch. From sourcing the right food trucks or carts to custom printed menus, stanchions, or waitstaff, our team of food truck professionals are there every step of the way. 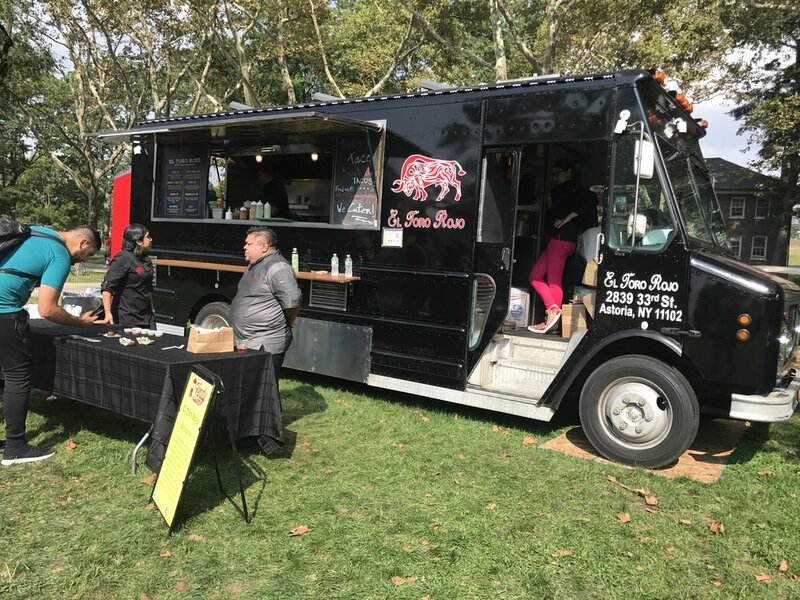 Book food truck vendors with the NYFTA and we will take care of the billing and required paperwork, making sure the food trucks are properly insured and up to date on all of their inspections. Feel the excitement (and deliciousness) of food trucks at big events with our recap of video of NYFTA food trucks at New York Comic Con 2017. Hungry yet?